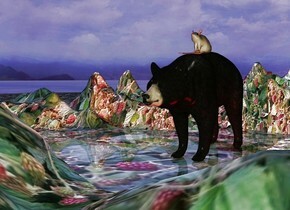 A 30 feet high 50% dark rat is -5 feet above a 150 feet high bear. The ground is 300 feet wide image-11298. It is 200 feet high. The sun is mauve. Camera light is khaki. A red light is right of the bear. A light is in front of and right of the rat. a shiny [silver] crash dummy. a shiny [silver] cone is -1 inch above the crash dummy. the sky is rosy brown. the ground is clear. 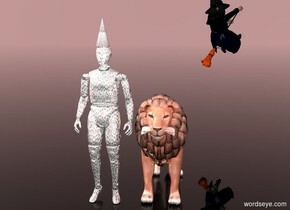 a shiny terracotta lion is to the right of and -5 feet in front of the crash dummy. a witch is above and 8 feet behind and to the right of the lion. she faces northeast. her shirt is black. her skin is green. the first dog is in the ground. a second dog is 1 foot in front of the dog. it is facing the first dog. the second dog is -9 inches above the ground. it is leaning 30 degrees to the back. a third dog is 2 feet to the right and behind the second dog. it is facing the first dog. a fourth dog is to the left and -8 inches behind the second dog. it is facing the first dog. it is leaning 30 degrees to the back. 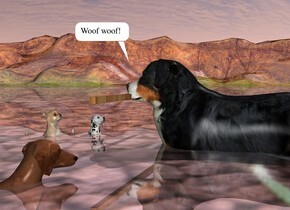 the [wood] stick is -2 inch in front of the first dog. it is -8.5 inches above the first dog. it is leaning 90 degrees to the right. the shiny ground. a 30 feet long [texture] fence. a 30 feet long road is behind the fence.it faces right. the ground is grass. a house is behind the road. the wall of the house is brick. the window of the house is shiny. the roof of the house is [metal]. a house is in front of the fence. it faces right. a dog is -1.2 feet in front of and -19 feet left of the fence. it faces back. it leans 35 degrees to the back. a sled dog is -1.2 feet behind and -19 feet left of the fence. it leans 37 degrees to the back. 1st bush is -1 feet in front of and -19 feet left of the fence. 2nd 2 feet tall bush is -20 feet left of and -.5 feet in front of the fence. a tree is -5 feet behind and -10 feet left of the fence. it is -5 feet above the ground. a coral light is above the sled dog. a wood table. a 1st 2.5 foot tall chair is -.5 foot to the left of the table. it faces the table. a 2nd 2.5 foot tall chair is -.3 foot to the right of the table. it faces the table. a first woman is -4.3 feet above the 1st chair. she faces the table. a 2nd woman is -4.3 feet above the 2nd chair. she faces the table. a 1st .3 foot tall cup is on and -1.5 foot in front of and -1 foot to the left of the table. it faces right. a 2nd .4 foot tall cup is on and -1.5 foot in front of and -1 foot to the right of the table. it is noon. a 1st small plate is to the right of and behind the first cup. a 1st cupcake is on the plate. a 2nd small plate is to the left of and in front of the 2nd [china] cup. a 2nd cupcake is on the plate. a 1st fork is behind the first plate. it faces right. a 2nd 9 inch deep tin fork is -.1 foot in front of the second plate. it faces right. a 5 foot tall and 8 foot wide [wall] window is behind and -1 foot above the table. a 50 foot wide [building] structure is 30 feet behind the window. it is on the ground. 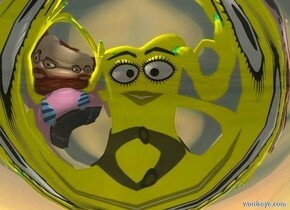 it faces back. a coral light is in front of and -1 foot above the structure. a midnight blue light is 20 feet above the ground. 1st man is 3 feet in front of the structure. he faces left. a 2nd man is 1 foot in front of and to the left of the 1st man. he faces the 1st man. a woman is behind and 2 feet to the right of the first man. she faces left. the ground is charcoal gray. a large wall is 10 feet in front of the window. it is 10 foot tall [coffee] . a gold light is 10 feet above the table. a beige rose light is .8 feet to the right of and -.6 feet above the 1st woman. 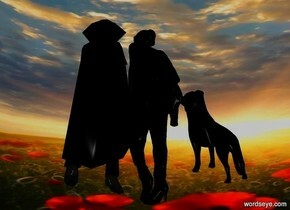 a black dog to the left of the 2nd man. the dog faces the man. A 1st woman leans 180 degrees to the front. A 2nd woman leans 180 degrees to the front. A 3rd woman leans 180 degrees to the front. A 4th reflective woman is .1 inches in the 1st woman. a 5th reflective woman is .1 inches in the 2nd woman. A 6th reflective woman is .1 inches in the 3rd woman. The ground is reflective pink. The [image-9581] sky is hot pink. A white light is in front of the 2nd woman. The ambient light is lavender. A gold light. a house. the house's wall is wood. a 1st invisible dog is -40 feet in front of and -15 feet to the left of and -2.3 feet beneath the house. a linen light is 5 feet above the dog. a 5 foot tall terracotta fireplace is 10 feet to the right of the dog. it faces left. 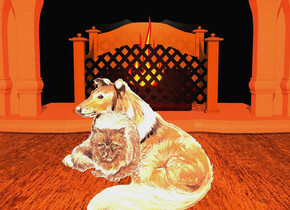 a 2nd very small dog is 5 foot to the left of the fireplace. it faces left. a small cat is -1.1 foot behind and -1 foot above the 2nd dog. it faces left. the house's yard is 5 foot wide wood. the interior of the fireplace is black. a large flame is -2 foot to the left of and -4 feet above the fireplace. it faces left. the ambient light is linen. a small mahogany light is 6 feet to the left of the fireplace. the camera light is brown. 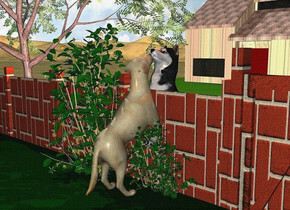 a man.the man is face up.a cat is -15 inches above the man.the cat is facing north.the cat is -36 inches behind the man.a dog is right of the man.a tiny marble is behind the man.the dog is facing the marble.a flat wall is left of the man.the wall is facing right.the wall is 1 inches in the ground.the wall is [garden].the ground is silver.the wall is 20 feet tall.the cat is orange. 1st 10 feet long and 1.5 feet wide and 1 inch tall clear wave. it is -.1 inch above the ground.the ground is shiny black. 2nd 8 feet long 1.2 feet wide and 2 inch tall clear wave is -.1 feet left of and -6 feet behind the 1st wave. it is -.2 inches above the ground. 3rd shiny black 12 feet long and 2 feet wide and 3 inch tall wave is -.5 feet right of the 1st wave. it is -.3 inches above the ground. the sun's azimuth is 270 degrees. the sun's altitude is 16 degrees. the sun is pond blue. a shiny moon is 15 feet left of and -3.3 feet to the front of and 3 feet above the 2nd wave. the sky is shiny black. 2 cyan lights are -.3 feet above and .1 feet right of the moon. a aqua light is -14 inches above the moon. a small [rock] rock is -8 feet in front of and -1.2 feet above the 3rd wave. a 40% cobalt blue light is 3 feet left of and 5 feet above the 3rd wave. the camera light is dim storm blue. a branta is -.5 feet in front of and 2 feet right of the moon. it faces right. a small stork is -.2 feet above the rock. it faces northwest. 4th 9 feet long and 1 feet wide and 3 inch tall clear wave is 3 inches left of the 2nd wave. 5th 13 feet long and 1 feet wide and 4 inch tall clear wave is 8 inches left of and -18.3 feet to the back of the 4th wave. a 1st 20 foot wide and 15 foot tall wall is 20 foot wide image-11266. the camera light is black. a wildness light is 20 feet in front of and 25 feet to the left of the wall. a cyan light is 20 feet in front of and 25 feet to the right of the wall. a linen light is 20 feet in front of the wall. a bird is -12 foot above and in front of the wall. it faces southwest. 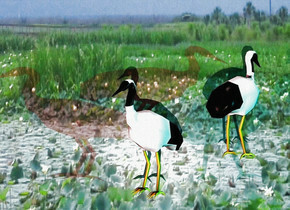 a 2.8 foot tall crane is to the right of and -2 feet above the bird. the crane faces northeast. it is night. an antique mauve light is 20 feet above the crane. sky is 1900 feet tall.sky is 20000 inch wide [cloud]. .it is evening.ambient light is gold.a 50 inch tall black man is 35 inch above the ground.the man is facing northeast.a 65 inch tall black woman is -1 inch right of the man.the woman is facing north.a 30 inch tall black dog is 3 inch right of the woman.the dog is facing the woman.ground is clear black.the dog is 50 inch above the ground. a 70 inch tall white marble is 450 inch in front of a 30 inch tall woman...ground is [abstract].ground 50 inch tall.ambient light is gray.a 12 inch tall man is -7 inch left of the woman.the man is -15 inch above the woman. a 1st man.a 1st woman is -28 inches in front of the man.the woman is facing left.the woman is 2.5 feet above the ground.the woman is leaning 20 degrees to the south.silver ground. [space]sky.the sun is sea spray blue.the woman's bathing cap is white.the woman's one piece bathing suit is white. There is a 1st white angel. A 2nd white angel is 6 feet in the 1st white angel. There is a marble behind the 2nd angel. The 2nd angel faces the marble. A 3rd clear angel is 6 feet in the 2nd angel. The 3rd angel faces the left. A 4th clear angel is 6 feet in the 3rd angel. The 4th angel faces the right. The ground is concrete. A gold light. There is a table to the right of the 1st angel. The table is 1 inch in the ground. A woman is to the right of the table. The hair of the woman is white. The dress of the woman is orange. The table is 2 inches to the left of the woman. The woman faces the table. There is a pizza on the table. A 1st plate is 1 foot to the right of the pizza. A 2nd plate is 1 foot to the left of the pizza. A 1st slice is 1 foot above and 1 foot to the left of the 2nd plate. The 1st slice leans 90 degrees to the front. A 2nd slice is on top of the 1st plate. A 1st bottle is behind the 1st plate. A 2nd bottle is in front of the 2nd plate. A 10 foot tall gold umbrella is behind the 1st bottle. The umbrella is .1 inches in the ground. A long [image-11287] wall is behind the umbrella. The wall is 11 feet tall. a road is 2 feet in front of the table. A pink light is above the pizza. An orange light is above the 2nd plate. A 1st red light is to the left of the 1st angel. A 2nd red light is behind the woman. 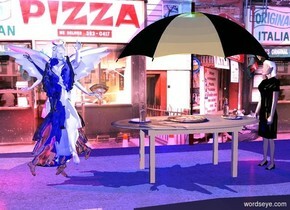 A cyan light is above the umbrella. a blue light is below the umbrella. The ambient light is blue. the sky is hot pink. the ground is clear. 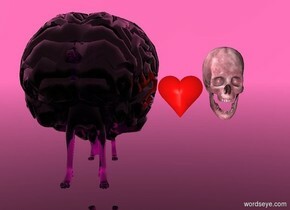 there is a very large purple clear brain. the brain is 1 foot above the ground. a clear purple dog is 3.7 feet in the brain. a large pink bone is 2 feet to the right of the dog. the bone is 2 feet above the ground. A small heart is to the left of the bone.